Or grab it at http://gist.github.com/103126. Note 1: of course this does not work if the web page explicitly sets the background color. For example, google.com (see its HTML source) forces a white background. Note 2: with Qt 4.4's QtWebKit, you have to use the background brush instead of the base brush. This is changed in Qt 4.5 for consistency with the rest of Qt (it is mentioned in Qt 4.5.0 changes file). The roadsign should be animated, is it? 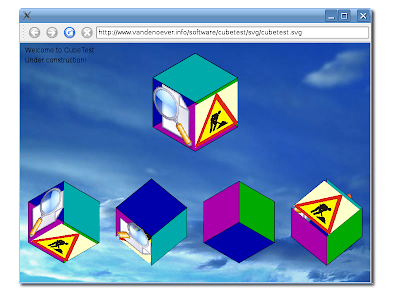 None of the QWebKit based browsers animated the digging man (though they did a little better than Opera which didn't render the man at all and much better than KHTML which didn't render the svg at all). Firefox/Gecko was the only browser to render everything on my machine. on the one hand: awesome! now it's transparent. on the other hand: why isn't this the *default* behavior? why isn't there at a minimum some non-voodoo way to achieve this? @maininalift: looks like a bug. @Aaron: the default is always the tricky part, half of the planet will just hate it no matter what. Since opaque, non-transparent painting seems to be the common case, it's chosen to avoid the surprise. Anyway, QWebPage::palette documentation already says "The base brush of the palette is used to draw the background of the main frame." I'd suggest that this should be covered in the docs. I for one wasn't aware of it. but i also had to add the view->setPalette(palette) line to get it working.